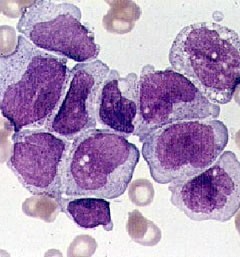 During cases of a bone marrow exam, the bone marrow sample is evaluated to find out why blood cell levels are abnormal. 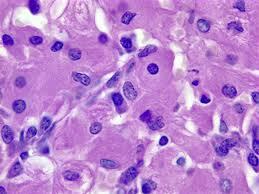 A doctor may obtain 2 different kinds of bone marrow samples: a bone marrow core biopsy and a bone marrow aspirate. Both types of bone marrow samples are generally obtained from iliac crest (hipbone), although marrow aspirate is sometimes obtained from sternum(breastbone). In young children, bone marrow samples are obtained from vertebra (backbone) or tibia (leg bone). Both types of bone marrow samples are generally obtained at the same time. An individual can lie on 1 side, facing away from the surgeon, with the knee of the top leg bent. 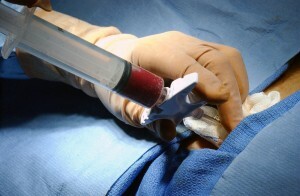 After the tissue and skin over the bone is numbed with a local anesthetic, the doctor inserts a needle in to the bone and withdraws the marrow, which may be spread on a slide and tested under the microscope. Specific tests including chromosomal and viruses, fungi and bacteria cultures analisis may be done on the bone marrow sample. Although, the aspirate bone marrow sample frequently gives enough information to determine diagnosis, the marrow drawing process into the syringe breaks up the fragile bone marrow. 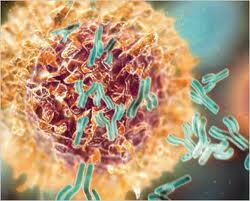 As a result, determining the cells original arrangement is difficult.